Courtesy Visit by H. E. Mr. Egidijus Meilunas, Ambassador Extraordinary and Plenipotentiary of the Republic of Lithuania. 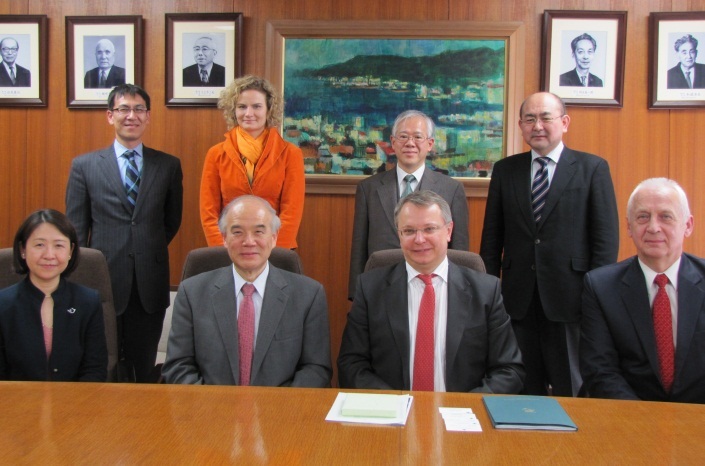 On January 29, 2014, H. E. Mr. Egidijus Meilunas, Ambassador Extraordinary and Plenipotentiary of the Republic of Lithuania and Dr. Albertas Algirdas Dambrauskas, Minister Counsellor, Embassy of the Republic of Lithuania in Japan paid a courtesy visit to Professor Takashi Onishi, President of Science Council of Japan (SCJ) and Dr. Fumiko Kasuga, Vice-President of SCJ in Charge of International Activities. The purpose of their visit was to explore the possibilities of cooperation in science and technology between both countries. The topics of discussion also covered Japanese diplomat Mr. Chiune Sugihara, who served as Vice-Consul for then Empire of Japan in Lithuania. During World War II, he humanely helped several thousand Jews by issuing transit visas to Jewish refugees so that they could travel to Japan. During this visit the Ambassador introduced the upcoming international forum about life sciences which will be held in Vilnius in September this year. President Onishi explained the roles and the characteristics of SCJ and other scientific organizations in Japan. He also introduced the SCJ’s collaborations with international scientific organizations and academies overseas. The participants had an exchange of views and opinions on the recent trend of science and technology in two countries.